Question: Are you tired of high-fat, salty salad toppings that compromise your health goals? Let me suggest something delicious, healthy, and completely different. Discover easy and fun dressing-creation techniques that allow you to make tasty toppings with fresh produce. Get my best raw salad dressings and sauces. Learn why fatty, high-salt, processed dressings are destroying perfectly good salads, and won't bring you the body and vitality you're looking for. I'm happy to introduce you to Savory Raw Dressings and Sauces, a unique raw food salad dressing book designed to teach you to create nutritious and delicious raw dressings from scratch - toppings that make each and every meal unique. 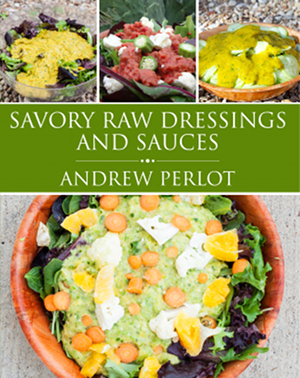 Since this book is available both in print and as a downloadable e-book, you can get instant access to the delicious tips and techniques in Savory Raw Dressings and Sauces. Andrew's 14 favorite dressing and sauce recipes to get you started, including Mango Delight, Purple Grape Dressing, Ruddy Pineapple, Corn Medley, and Italian Tomato Sauce. In the ebook version, easily print recipes and all other sections of the ebook for reference at any time, or view it on your computer, tablet, e-reader, or dozens of other viewing devices. Learn why traditional raw high-salt, fatty, heavily-processed dressings are unhealthy, and how you can do much better yourself using the simple, whole ingredients found in any supermarket. Bonus: As a special bonus, when you buy the book you'll also receive a compilation of the best recipes submitted by readers of raw-food-health.net. Full book in .pdf, .mobi, and .epub formats, which can be viewed on most computers, tablets, e-readers, phones, and electronic devices. Including: PC, MAC, Amazon Kindle, iPad, iPhone, iPod Touch, ILiad, Sony Reader, Kobo E-Reader, Barnes & Noble Nook, Most Blackberry phones, and many others. The printed version of Savory Raw Dressings And Sauces consists of a 72 page 8" x 10" softcover book. The interior photos are in color. Books generally ship within 48 hours. Shipping rates and times vary depending on destination country. 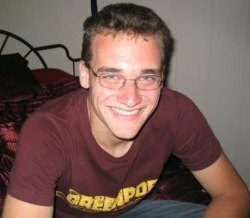 Hi, my name's Andrew, and I've been thriving on a diet of raw fruits and vegetables since January of 2007. During that time, I've found the ability to make quick, delicious salad toppings out of fruits, vegetables, and herbs is one of the keys to success on a raw food diet. I eat a lot of fruit, but we need to get plenty of vegetables to be healthy too. When I started out, I was often not too enthused about eating more than a few pieces of lettuce per night, but then I stumbled on a secret - I could easily make dressings that tasted just as good or better than the bottled junk I'd been using before. I started experimenting with making dressings and sauces using whole fruits, vegetables, and herbs, and the results were fantastic. Today I eat between one and three heads of lettuce or another leafy green vegetable every night, and a big part of my enthusiasm for those meals is due to the dressings and sauces I whip up to go on top of them. 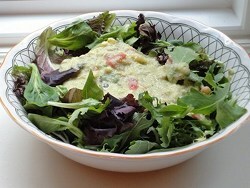 Many health seekers are in a similar bind, and I created Savory Raw Dressings and Sauces to help them out. Why Are These Healthy Dressings So Important? Do you love oil on your salad? So did I, but now I know that fatty meals trap sugar in the blood stream, a precursor of diabetes and candida. Now I love making delicious recipes that exclude oil. Did you know that the processed salt found in most dressings is very different from the sodium found in fruits and vegetables? The first dehydrates, raises blood pressure, and degrades bones while the later is necessary for the proper function of every cell in your body. Can you guess what classic dressing ingredient appears on chemists' shelves with a skull and crossbones on the label? Learn which one in the ebook and how you choose better options. The instructions in this book are for the creation of nutrition-focused recipes that are cholesterol-free, dairy-free, salt-free, egg-free, 100 percent vegan, and low in fat. It's about helping you to become a better whole-foods uncook. Even if you're not enthused about creating your own recipes, or simply want a few examples of how dressings and sauces can be put together, I've included my favorite 14 raw dressings and sauce recipes for you to experiment with. After you've whipped a few of them up, you just might be inspired to get creative yourself. None of the recipes include: salt, animal foods, cooked ingredients, pepper, alcohol, onions, honey, agave, garlic, cacao, chocolate, grains, nutritional yeast, oil, nama shoyu/tamari, seaweed and/or other "sea vegetables", vinegar, sauerkraut, or any other fermented food. Each recipe tells you how many calories it contains, the percentage of calories that come from fat, protein, and carbohydrates, and includes a picture to show you what the final product looks like. I'm half Italian, and when I went raw I started to miss the blend of tomatoes and herbs found in so many dishes from my childhood. 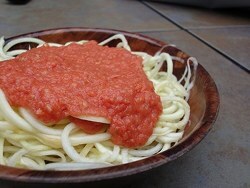 After awhile I figured out I could make something that tastes just as good, and Andrew's Italian Tomato Sauce was born. I use it on salads as well as raw zucchini noodles. There's not much that can compare to Mango Delight. I'm always pumped when local corn comes into season and promptly chow down. A few years ago I started to wonder how a good ear of corn would taste as part of a dressing, and Corn Medley was the delicious result. "I bought this book expecting a great recipe book, and what I got was not just that, but a how-to manual on how to create my own delicious recipes. Thanks Andrew!" "I bought the savory raw dressings and I totally love them. I have tried most of them and they are absolutely delicious. I like them because they are simple, oil free, salt free and just good for you all over. Thank you Andrew for creating yummy dressings for people who eat low fat raw vegan." 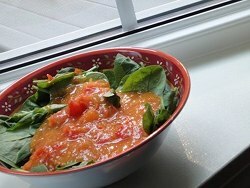 "I tried the very first recipe, the Mango Nectar Dressing. Since it’s only two ingredients, it’s ridiculously easy and simple. But the taste is so light and refreshing, I didn’t miss the oil or vinegar at all." With your purchase of Savory Raw Dressings and Sauces you'll receive personal email support for any issue that come up. If you have any technical problems with the ebook or just need some clarification about a recipe, you can ask anytime and I'll get right back to you. Pay with a credit card, debit card, echeck, or Paypal. Choose the option you're familiar with. Because each transaction is secure, you can feel comfortable with your purchase. Because my product is electronic or are produced via print on demand technology, I have very low distribution costs. I don't need to recoup as much from the production end of product creation, so the price you pay is lower. I don't want to rip you off. Learning to eat healthy shouldn't bankrupt anyone, and I want you to have every reason to succeed in going raw or improving your diet to the extent that you want. In the run-up to the launch of Savory Raw Dressings and Sauces, I decided to run a best healthy raw recipe contest for readers of raw-food-health.net, and gave away copies of the ebook to the three winners. As a bonus to buyers, I'm offering a compilation of the best recipes submitted as part of that contest: Two smoothies, a salad, two soups, some raw spaghetti, and a dip that will rock your taste buds. Since this is a downloadable e-book, you get INSTANT ACCESS to the delicious recipes and techniques in Savory Raw Dressings and Sauces. Savory Raw Dressings and Sauces is a downloadable e-book with clickable links throughout to help you expand your knowledge of the raw food diet and healthy eating. How you can ditch recipes and start making your own unique salad toppings every night in the week in just minutes. Get Andrew's 14 favorite dressing and sauce recipes, including Mango Delight, Purple Grape Dressing, Ruddy Pineapple, Corn Medely, and Italian Tomato Sauce. Easily print recipes and all other sections of the ebook for reference at any time, or view the ebook on your computer, tablet, e-reader, or dozens of other viewing devices. Learn why traditional and raw high-salt, fatty, heavily-processed dressings are unhealthy, and how you can do much better yourself using simple, whole ingredients found in any supermarket. Special Price: $10 (ebook) $22 (print).